For the last few years, we’ve ordered an eighth of a cow from a coworker of N’s. His family has a smaller ranch called Grazed Right. Our beef order has since become something we look forward to every fall as the beef is some of the best I’ve ever had. (I am in no way affiliated with their ranch, btw – I truly love their beef & have recommended it to most of our close friends.) Ben & his family are really great people & I’m happy to support them in becoming successful full-time ranchers. I hope they’re well on their way to achieving that goal! 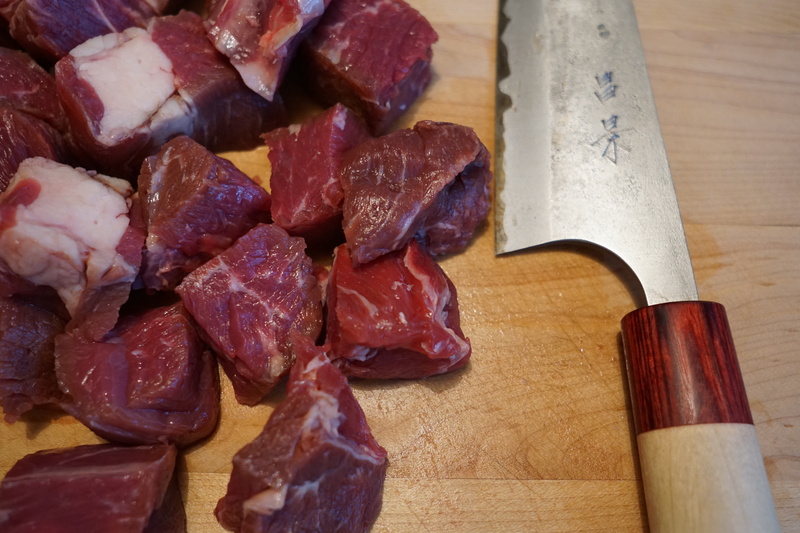 One of the unexpected perks of ordering a portion of an animal is learning to cook cuts that you may not have otherwise bought. 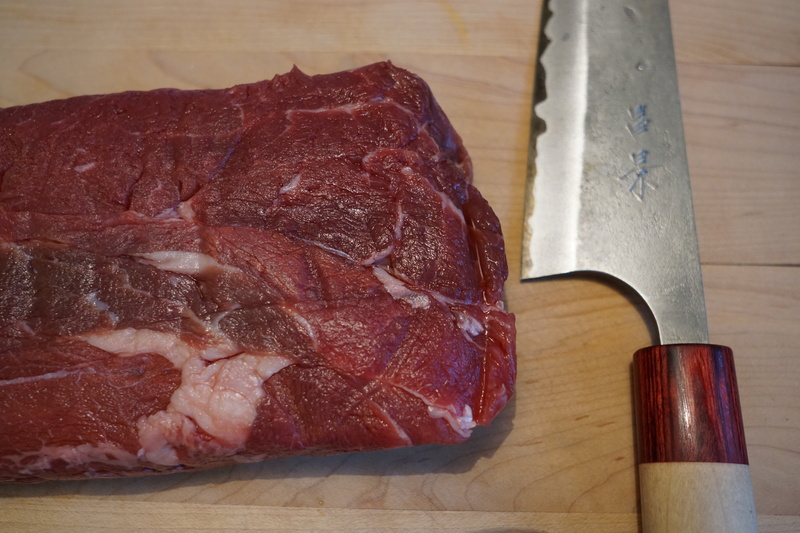 I’m very rarely intimidated by any cut of beef anymore since every eighth has such a variety – from bone-in steaks to roasts to chuck steak & short ribs. It’s a great opportunity to get a little creative in the kitchen. We were discussing our upcoming beef orders recently & comparing what we had left from the previous year. As N & I are on our third year, we’ve fared a bit better with our ground beef usage especially (when you order in bulk, you generally get a lot of ground beef – we turned some of ours into sausage which definitely helped!). 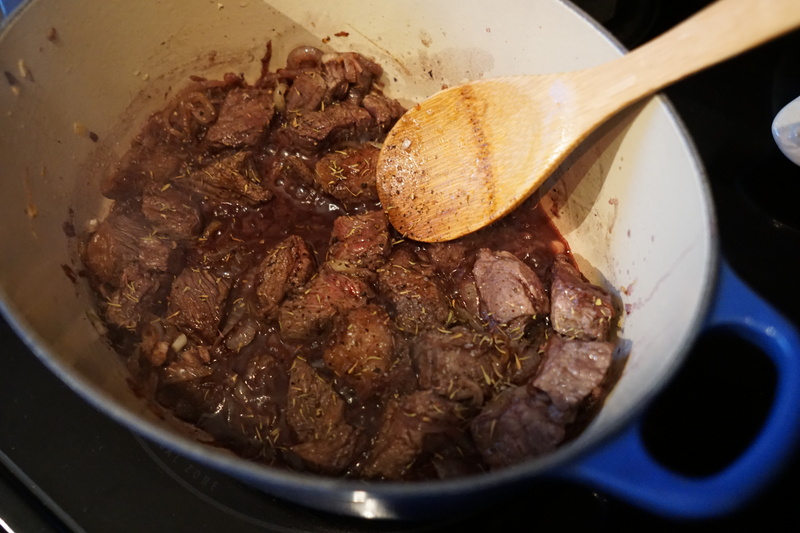 A few people mentioned they still had chuck steaks leftover since they usually require a lengthy marinade. 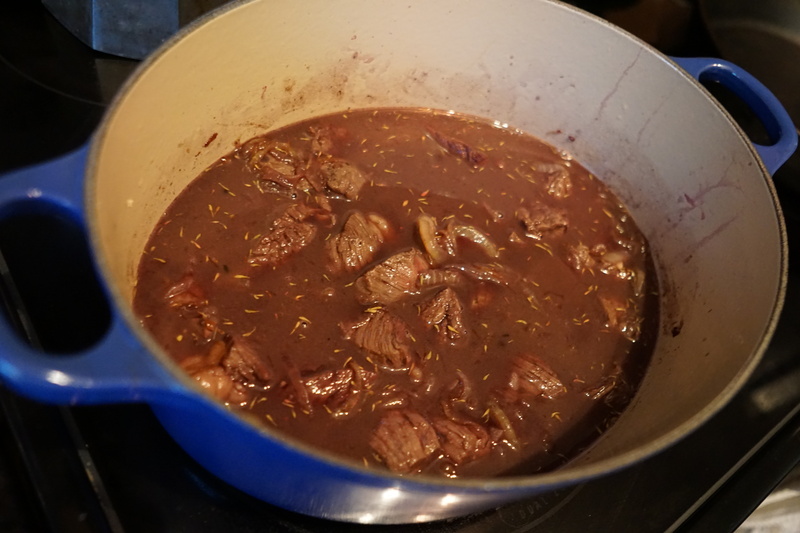 Personally, I marinating a bit tedious so I’ve turned to braising instead. While it is a slower method of cooking, it’s virtually foolproof & a delicious way to turn a tougher cut into something wonderful. I love that this method is back in popular rotation – I’m sure my grandparents would have a good chuckle over what was probably a common way to for them to cook. I thought I’d share my favourite recipe on the blog today, in case you’re looking for a way to use this cheaper cut. I’m using the term recipe pretty loosely here – there’s really nothing groundbreaking here. 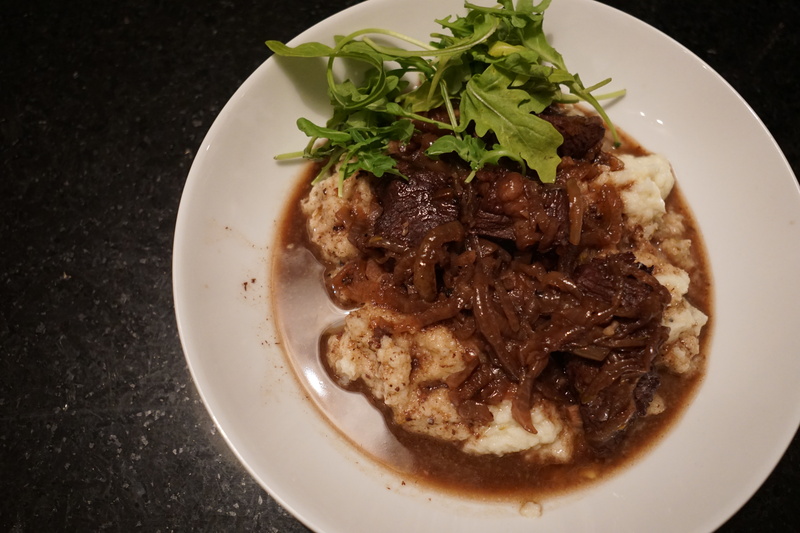 For those of us who forgot about braising though, I hope it serves as a little inspiration to put it back into your weekday rotation. 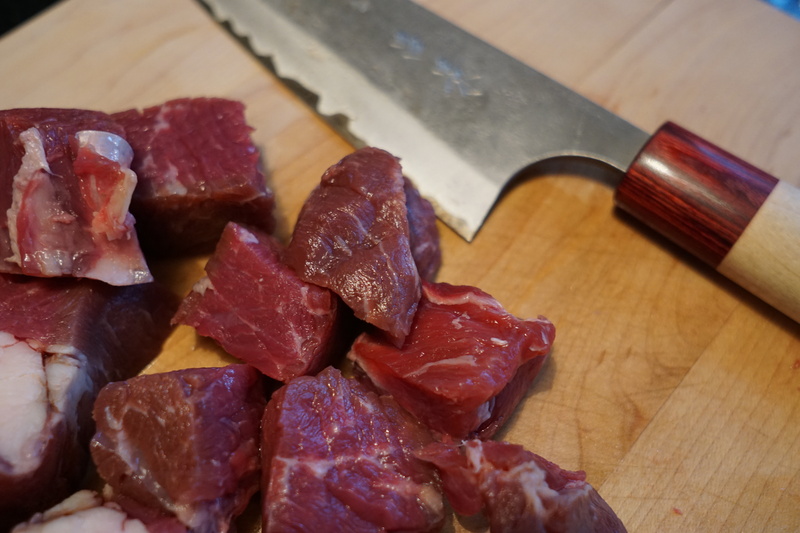 Get your chuck steak out. I usually let my meat come to room temperature before I throw it on the grill on in the oven. This is especially true with chicken, but I find it works well for keeping steak juicy too. Add the butter or fat to the dutch oven. 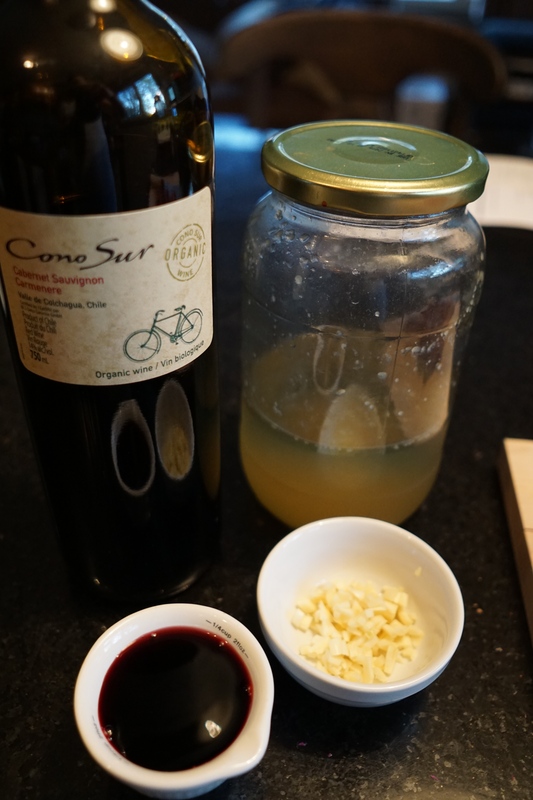 I use a mix of bacon fat & butter. Once it has melted, you can add your onion & turn it down to low. You want to slowly cook the onion until it’s caramelized. While this is cooking, grab your steak. 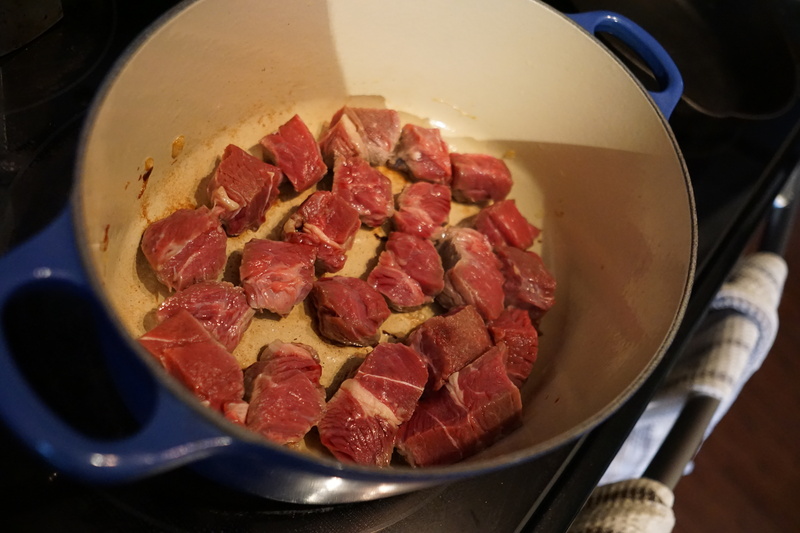 Preheat the oven to 325 F. Cube your steak & set aside in a bowl. 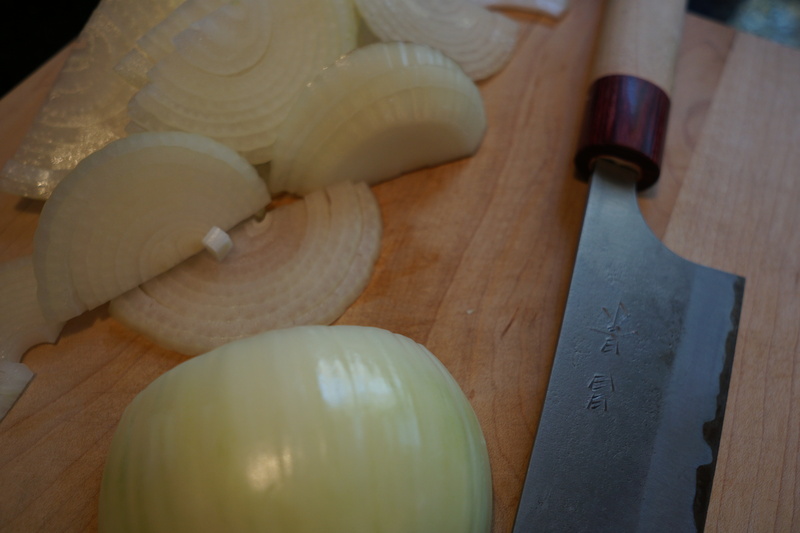 Keeping an eye on the onions, measure out the rest of your ingredients. Mince the garlic if you haven’t already. Measure out a cup of stock & 1/4 cup of wine. 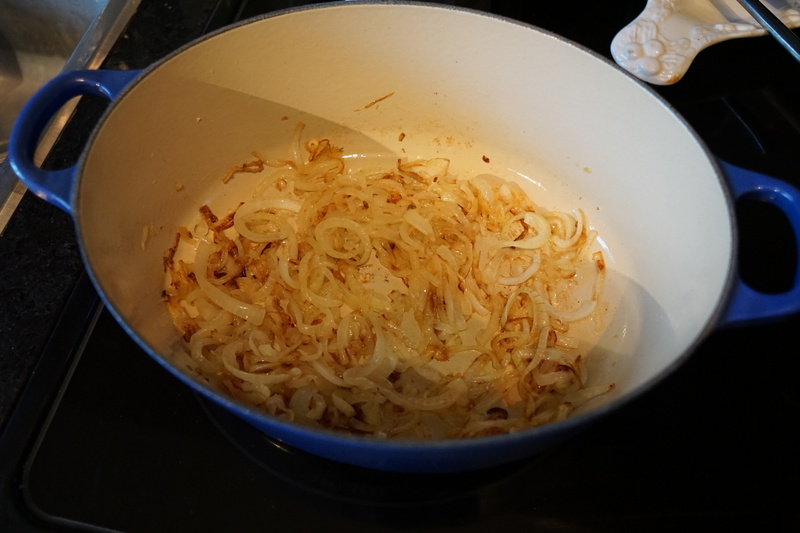 When your onions are almost caramelized, add the garlic. Cook until fragrant. Remove the onions & garlic & set aside. Add the steak to brown on all sides. Cover & put in the oven. Set your timer for 30 minutes. I check it every 30 minutes or so until the sauce has reduced & the meat is tender. It usually takes about an hour & a half to two hours. After an hour, I’ll usually start prepping my side dishes. 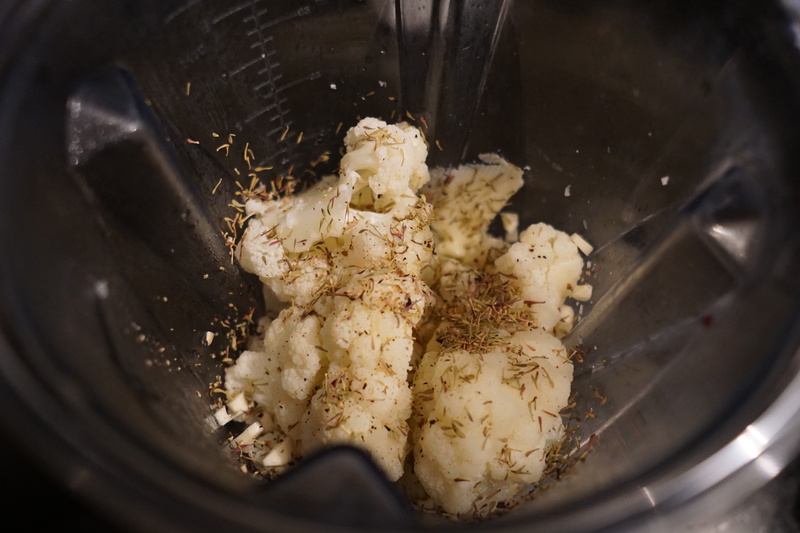 We like to pair this with mashed faux-tatoes (cauliflower pretending to be mashed potato). It’s really simple & delicious. It would also go well with real mashed potatoes or even rice, if you’re like one of our friends who loves rice! When it’s done, it will look like this. If you’d like to add a little flour to your sauce (or make a roux), that would probably be lovely. I sometimes add a tiny bit of tapioca flour to thicken it, while keeping everything gluten-free. I don’t think it needs it though if you don’t want. 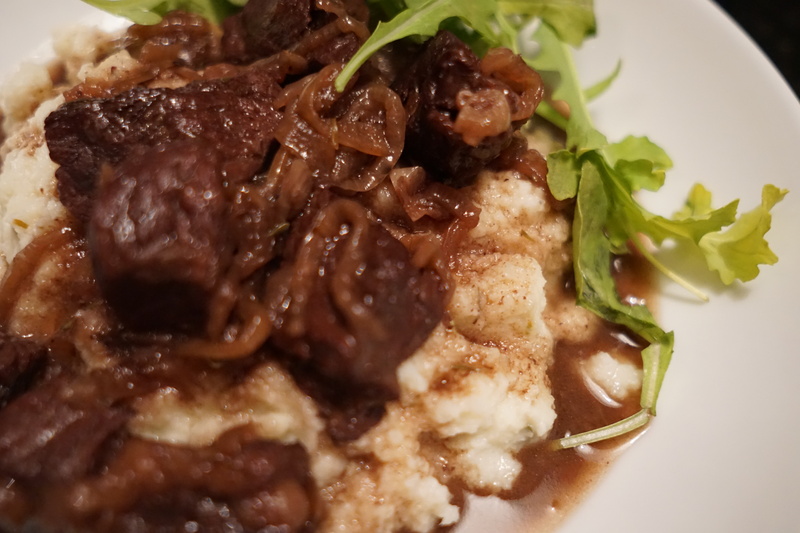 I served it on top of the mash & added a bit of arugula. That’s it! It makes for a delicious meal! So that’s how I make use of our chuck steaks. These are more guidelines than anything else – add your own twist (& let me know how it goes!) or keep it the same. 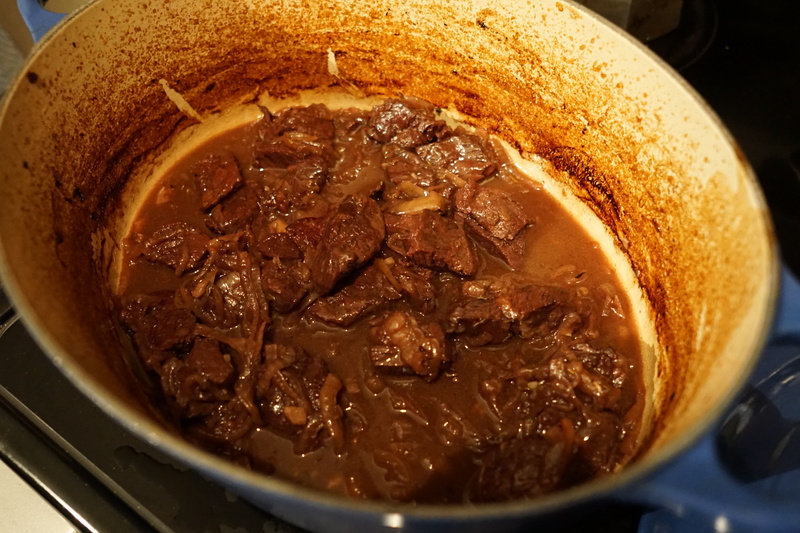 While braising is a bit of a slower process, I think it’s worthwhile. Your whole house will smell fantastic, it’s relatively hands off, & you end up with a fantastic, hearty meal at the end. Thanks! I’ve made it a few times now & it’s pretty easy. I love it when an experiment turns out great. ? Made this for my husband one night and needless to say it’s on the menu again this week. Thank you, it was very easy and most of all delicious!! Glad to hear you enjoyed it! It’s a definite weeknight staple in our house too!